"Gail Gibbons's detailed introduction to horses is packed with historical facts, breed information, care and grooming tips, facts about their anatomy and methods of communication, and more. Those familiar with Gibbons's nonfiction titles will wonder how the labeled illustrations translate to audio. The answer is not elegantly-at least not for nonreaders and beginning readers. Corey Pierno first reads the text beneath the illustrations on each page, and then the words found in the illustrations and insets, such as equine anatomical terms, names of pictured breeds, and brief horse facts. With this nonlinear print format, unskilled readers will have difficulty following the narration. Pierno's well-paced and deliberately pronounced reading is supplemented with sound effects of neighing, whinnying, and galloping horses as well as brief snippets of background orchestra music. Page-turn signals are optional. Confident readers will enjoy this pleasant read-along while learning much about horses. 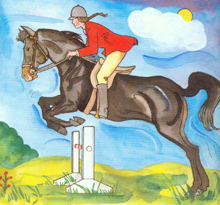 Children with an interest in horses will find this title an adequate springboard for further reading."